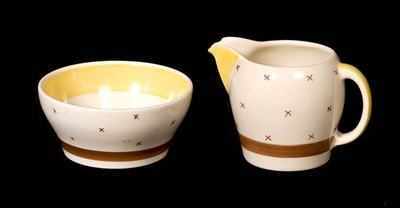 Milk and Sugar in the Kestral shape and Tyrol pattern by Susie Cooper. Both in excellent condition. No damage or restoration. Both date to 1934/5. Both signed Susie Cooper. Pattern number 1524. Price £95 for the pair.